Have you ever tried replacing regular spaghetti noodles with baked spaghetti squash? If you haven't, then you're in for a real treat. 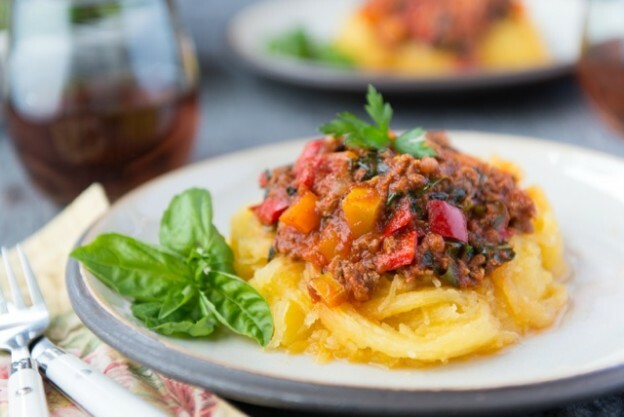 Spaghetti squash is such a nutrient-dense, and deeply satisfying food! In fact, we started growing it in our garden (it's very easy to grow). For instructions on baking winter squash, turn to page 260 in The Whole Life Nutrition Cookbook. The homemade Bolognese sauce recipe below is loaded with fresh summer vegetables and herbs, so it's not only filled with flavor but important nutrients as well. When purchasing ground beef, be sure to look for organic grass-fed beef at your local farmer's market or health food store. This beautiful recipe comes from our Whole Life Nutrition Cookbook! I like to make this sauce toward the end of summer when there is an abundance of vegetables needing to be used. You can freeze the sauce in pint-size jars for future use. I prefer to serve the sauce over baked spaghetti squash, but my children prefer brown rice noodles—either way it’s a nutrient-dense meal! Serve with a large green salad. Heat the olive oil in an 11- or 12-inch, deep skillet over medium heat. Add the onion and sauté for about 5 minutes. Add the garlic, Italian seasoning, sea salt, and ground beef and sauté for another 5 to 7 minutes, or until the beef is no longer pink. Add the carrots, bell peppers, and zucchini and sauté for 5 minutes more. Stir in the tomato sauce and paste, cover, and cook for about 20 minutes, or until the vegetables are tender. Stir in the kale, basil, parsley, black pepper, and red chili flakes and simmer for few minutes more. Taste and adjust the salt and seasonings if necessary. Serve over baked spaghetti squash or brown rice noodles. Is this a phase 2 recipe? I am surprised that the nightshade vegetable , tomato, is included - I would have thought that would have been added in phase 3 as a trial. Also, does the protol cover histamine intolerances? Do you have any protocols for histamine intolerances? My husband really suffers with that. Any information would really be appreciated.